Household bills are too high. 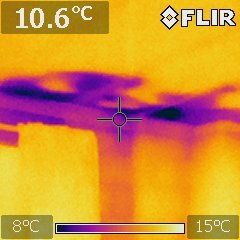 Indoor thermal image of a room showing poor insulation in the roof. Householders have been warned this week that they will have to find revolutionary ways to save energy as utility bills are set to soar because of green targets. About 10 per cent of the UK’s total energy generation capacity would be lost as coal and oil-fired power plants are to be shut down under a European environment directive and more could follow later this year. Within three years the UK’s spare cushion of power generation would fall from below 14 per cent to less than five per cent. The Government was banking on low-carbon energy from nuclear power and wind farms and by building dozens of new gas plants. But these moves would not be enough alone to stop the possibility of 1970s blackouts and would leave Britain reliant on imported gas. An average dual fuel bill is now more than £1,300 a year, an increase of more than 160 per cent in nine years. Midlands energy expert Ron Fox, who runs Noreus Ltd, agrees, but said there were steps householders could take now to make their homes more efficient and to cut their bills. Ron said firstly residents needed a thermal imaging camera which reveals air leaks and moisture in cavity wall insulation, water problems in flat roofs, defects in pipes or under-floor heating systems and inefficient seals around door and windows. Ron is so confident with the new technology that he is offering home owners a free thermal imaging survey to help reduce their energy bills. Easy and inexpensive ways to cut energy bills are closing curtains in the evening, filling a kettle with only the water needed, switching off lights when leaving a room, using draught excluders and turning down the central heating system by a degree or two. ● Insulating a roof and the walls with the environmentally-friendly Icynene Insulation System, which would save up to £600 a year. ● Investing in solar panels, cutting on average £237 a year in energy bills plus receiving Upto £14000 Government money for generating electricity for the National Grid. ● Buying a thermodynamic panel system which will give hot water for only around £1 a week and central heating for about £5 a week. 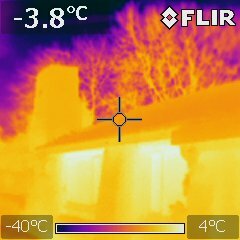 For more details about energy-saving or to book a free thermal imaging survey call Ron on 0845 474 6641. Heat lost though the wall and windows.